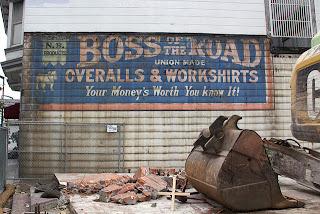 Ghost sign for BOSS OF THE ROAD Union Made OVERALLS & WORKSHIRTS recently exposed on 3rd Street in San Francisco's Bayview District during demolition for an expanded neighborhood library. 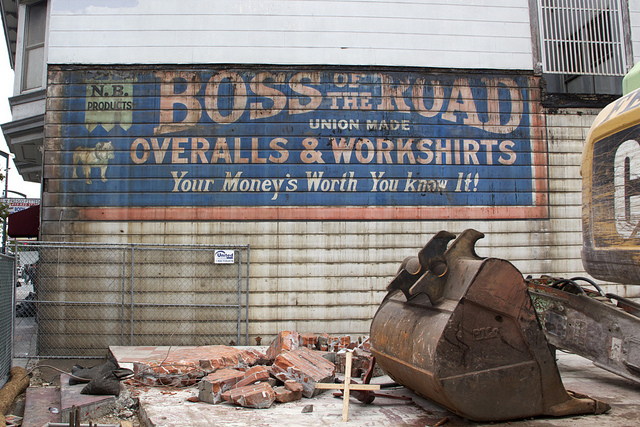 "The sign dates from before 1921, based on San Francisco Assessor's records for the demolished building," reports photographer David Gallagher. "Here's a 1928 shot of the street from the Jesse Brown Cook Collection at UC Berkeley's Bancroft Library." This billboard would be underneath the "Ed's Shop" sign on the right. Note the N.B. PRODUCTS flag located on the left, above the bull dog. Original owners Neustadter Brothers would sell the brand to Eloesser-Heynemann who in turn sold the brand to Lee. Big thanks to Shane for reaching out with a heads up on this wonderful ghost sign, photographer David Gallagher for capturing it in all its full color glory, and sfist.com for running the story in their arts & entertainment section.